The EaseCaddy panel is a Flash extension that allows you to store, import, export, and apply custom eases. Most objects in nature do not start moving at full speed and then immediately return to a stop, they transition gradually from a starting position and gradually to a stopped position. Easing is used in animation to simulate realistic movements by varying the rate at which an object travels to reach its final destination. There are a couple of default eases that arrive with Flash Pro. 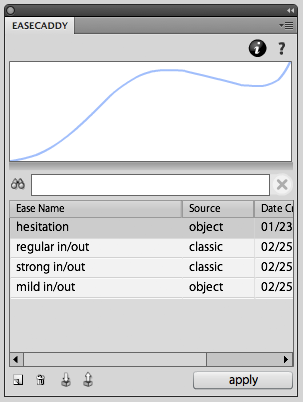 Flash also allows you to create your own custom eases by editing a bezier curve (classic | motion), but there's no easy way to store that curve for later use, unless you've got EaseCaddy that is. Download EaseCaddy and see for yourself. You can also upgrade to a Pro license for additional features. The Motion Editor has been removed from Flash CC. So how do you get those complex animations in Flash CC? Answer: Export your eases from an earlier version of Flash Pro using EaseCaddy and import them into Flash CC. Works with both classic tweens (motion tweens prior to CS4) and newer motion tweens (introduced in CS4).